Beer is an incredibly versatile ingredient. It adds a rich, earthy flavour to your savouries as if it's been cooking for hours (good cheat!) while adding depth to sweets. Beer can be a substitute for wine in recipes, but did you know, dear reader, that beer has the ability of being a leavener too? 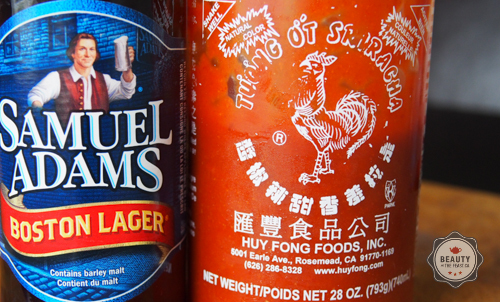 With the sky as the limit, it was daunting to make a decision but ultimately I decided I most wanted to take advantage of the refreshing hoppy flavour and pair it with... Sriracha! I grabbed a six pack of Samuel Adams Boston Lager (on sale, woot!) from the local BC liquor store and then flounced back home to begin my experiment. 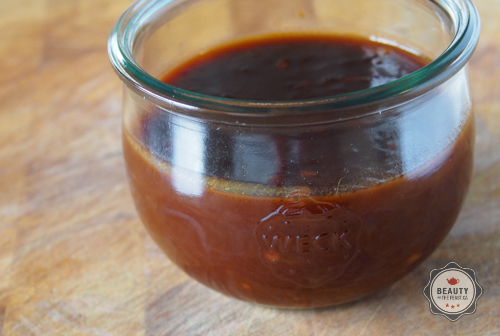 The result has been the creation of our hands down favourite BBQ sauce and it's super easy to make. You'll never buy it from the grocery store again. You won't want to. Enjoy. 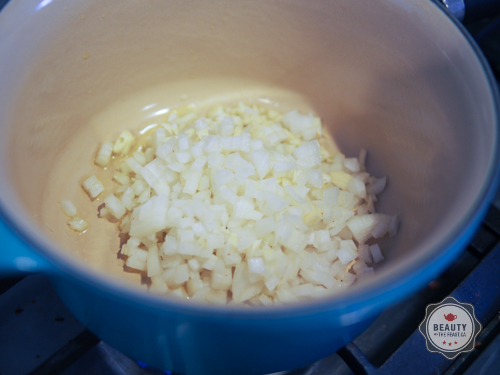 In a pot over medium heat, saute the onions, garlic and olive oil until the onions are soft. Should be around 5 minutes. Add the remaining ingredients and stir until combined. The sauce will bubble as you add the beer. It may also seem very thin but don't worry. After the next step you'll be left with a spicy/sweet sauce infused with a lovely, hoppy flavour. Bring to a boil, then reduce to a simmer, allowing to cook until thickened about 15 minutes. Stir occasionally to keep the onions from burning on the bottom. Allow to cool and use as you would your favourite BBQ sauce. I used the sauce on skin-on chicken thighs, but it would taste lovely on beef short ribs or beef hamburger patties... brilliant on prawns. Anything coated with this sauce is instantly culinary magic. Honest. The thing to note about this sauce is that it's very different from it's marinade state to it's BBQ version. 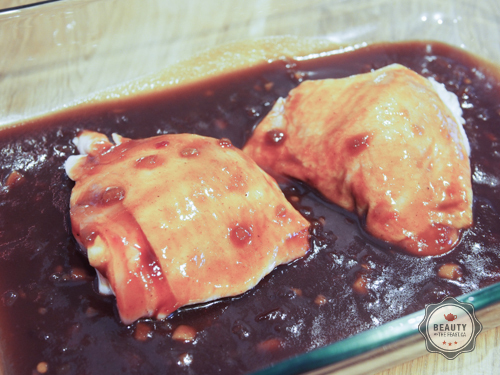 The brown sugar caramelizes on the meat resulting in a deliciously sticky, spicy glaze. The heat level on this recipe is mild to allow the other flavours through but feel free to amp up the sriracha to taste. Also, in addition to being reasonably priced, I chose the Sam Adams Boston Lager because of it's interesting story. In 1984, the beer landscape was vastly different from what it is today. Craft beers were virtually non-existent. Jim Koch, a Bostonian with five generations of brewers behind him, believed it was time to change that. He set out with his great-great grand father’s recipe and homebrewed the first batch of Samuel Adams Boston Lager in his kitchen. Jim hand-delivered samples around Boston, and in April 1985, Samuel Adams Boston Lager made its debut in about 25 bars and restaurants in Boston, all while only having two employees. That same year, Boston Lager was awarded the Best Beer at the Great American Beer Festival, and has gone on to win more awards than any other brewery in the world. Samuel Adams is still independently owned today, and Jim still spends time at the brewery coming up with new recipes for beers. If it was unclear from the introduction, this is a sponsored post. From time to time I work with quality brands to create recipes I think my readers will enjoy. Working with sponsors gives me an opportunity to create unique, quality content more often. I hope you agree. This post is sponsored by Branding & Buzzing.